Soil and Water Conservation Districts across the Commonwealth of Virginia assist landowners with the development and implementation of conservation practices. These conservation practices are installed through cost-share and tax credit programs that focus on water quality improvement and environmental stewardship. Not only do these practices improve our local environment, the installation and proper management of conservation practices also help to improve farm operational profitability. The Virginia Agricultural Cost-Share Program (VACS) supports various practices in conservation planning to treat animal waste, cropland, pastureland, and forested land. Though the specific amount varies, the cost-share program’s practices can often be funded by a combination of state and federal funds, reducing the landowner’s expense to less than 30% of the total cost. Eligibility for this program is based on the need for and benefit of implementing conservation practices. In Russell County, our main points of concern involve soil erosion, excess nutrients (i.e. manure) in localized portions of live waterways, and poor farm management. The goal of our Agricultural Best Management Practice (BMP) Tax Credit Program is to encourage voluntary installation of BMPs that address Virginia’s nonpoint source pollution water quality objectives. Our program offers a 25% tax credit (not to exceed $17,500 or the total state income tax obligation) against Virginia income tax on eligible costs associated with out-of-pocket expenses incurred while installing BMPs. Certain farm machinery is also eligible for a Virginia State Tax Credit. To learn more about VACS or the Agricultural BMP Tax Credit Programs, visit the Virginia Department of Conservation and Recreation’s website or give us a call. Every year, Clinch Valley SWCD participates in multiple classroom education outreach programs in Russell County. In these programs, the District teaches lesson plans ranging from the “Life Cycle of a Frog” and “Bird Migration” to “Advanced Map Reading” and “Understanding Ecosystems” – targeting age ranges from kindergarten to seniors in high school. In addition to our lesson plans, we also host (or participate in) a wide range of adult education programs as well – many of which revolve around the agriculture community. If you are interested in seeing what sorts of educational services we provide visit our Educational Resources page or call our Education Specialist Siobhan Nishida. To further our conservation efforts, Clinch Valley SWCD has a Certified Erosion and Sediment Control (ESC) Plan Reviewer on staff. Our ESC Plan Reviewer is responsible for reviewing construction plans submitted to our locality per Department of Environmental Quality regulations. These plans are required for any land disturbance that exceeds 10,000 square feet. If you are planning any construction projects requiring potentially land-disturbing activities and are unsure if you need an ESC Plan, please contact Brandon Blevins. Here at Clinch Valley SWCD we encourage producers to perform sustainable farming practices that benefit land, livestock, crops, and people. In order to facilitate this, we provide a no-till drill rental program that is available to anyone interested. No-till farming is an excellent way to increase the health and productivity of soils by increasing soil organics and water infiltration, decreasing cropland compaction, and greatly reducing or eliminating soil erosion. In addition, no-till farming is one of the most economical methods of planting pastureland and hayland, saving you both time and money. Our drill is perfect for planting all seed varieties. 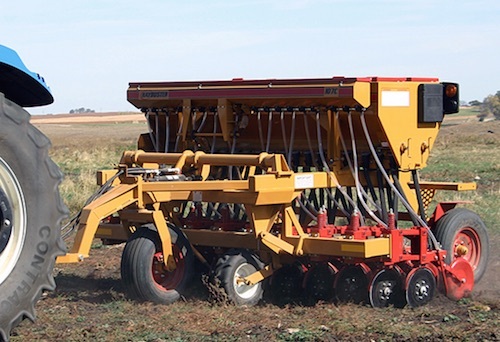 It features a 10 ft planting width and eliminates the need to plow and disk before planting. Cost is $11/acre and includes free set-up and calibration assistance. A minimum of 55 hp is required to pull the drill by tractor, and a truck with a sturdy hitch is required for transport. If you have any questions about no-till farming or our Haybuster 107C no-till drill rental program, please contact Brandon Blevins.